The growth of the polymer industry in the latter half of the 20th century has been phenomenal and shows no signs of decreasing. If the advantages of synthetic polymers over competing materials such as metals and ceramics are considered, it is reasonable to predict that polymers will take an even greater share of the total materials market in the future. Some of these advantages and disadvantages will now be discussed. Strength and stiffness in plastics should be discussed in terms of strength/weight or strength/cost ratios to be significant. unfilled plastics cannot approach structural metals in absolute values of strength or stiffness (where stiffness is proportional to modulus of elasticity). It also shows that plastics tend to be inferior to metals and to wood in stiffness/weight ratio (E/Sg). Only costly polymer composites (fiber reinforced plastics) approach alloy steels or hardened aluminum in strength/weight ratio (a/Sg). Increasing substitution of polymers for metals is not based on these factors; it is based on lower overall cost and superiority in other properties. Lower costs are due mainly to savings in fabrication or shaping processes and to parts consolidation (i.e., using fewer separate parts in an assembly). The energy absorption ability of any material depends not only on its strength, but also on its modulus of elasticity. The energy absorbed when a material is stressed in tension or compression up to its yield point is proportional to the square of its yield stress divided by its Young’s modulus. On this basis, rubber with a yield point of perhaps 2.5 MPa (363 psi) and small-strain modulus of about 3.5 MPa, is capable of absorbing about 10 times the impact energy of mild steel. Hence, rubbers are used for shock and vibration absorbers, and plastics are used for dent-resistant automobile panels. Design flexibility in plastics stems from their ability to be softened or melted and formed into complex shapes in single-step processes such as injection molding. If a plastic cannot be completely finished in a single step, a wide variety of economical secondary joining and decorating processes are available. Also, although the bulk of commercial plastics and rubbers fall into 30 to 40 basic families, many thousands of special types with different properties can be obtained by small changes in compounding and processing, so as to optimize material selection. By one count, there are over 8000 commercialized thermoplastics at present. Wall thickness can range from < 0.025 mm (0.001 in) for films and fibers to over 25 cm (10 in) for foam. 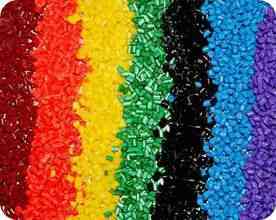 Colorability of polymers is virtually unlimited, and is an important factor in the sales appeal of many products. 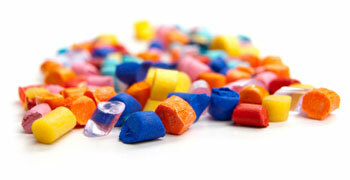 Polymers are easily colored by mixing concentrated pigments in the base polymer prior to extrusion or molding. The color is the same throughout the material, not just on the surface as in a painted metal. This usually eliminates painting costs and enhances scratch resistance. Transparency equivalent to commercial glass has been achieved with some plastics. Advantages over glass are impact resistance, formability at lower temperatures, and lower weight. Special features such as biocompatibility lead to plastics used for soft contact lenses. Easy moldability allows the economical manufacture of compact disks with special grades of laser-transparent polycarbonate. Translucent pastel colors have decorative advantages and numerous uses in toys and advertising. Ease of decoration of plastics is due to the development of a large number of processes for individual needs. Specially treated plastics can be electroplated or spray metallized to resemble polished and plated metals. Plastics can be thermally embossed for permanent surface marking. Thin films of extruded, wood-grain finish plastics can be easily laminated in a calender to base plastics for furniture applications. Electrical insulation properties are inherent in polymers. This makes them useful for wire covering, electrical plugs, and numerous other electrical and electronic components. Electronic circuits depend upon a variety of plastics for printed circuit boards, and component and connector insulation. Plastic housings for tools and appliances protect users from hazardous electrical shocks. Good insulation characteristics extend to high frequencies and include arc resistance. Electric motor windings are insulated with synthetic varnishes that are polymers. 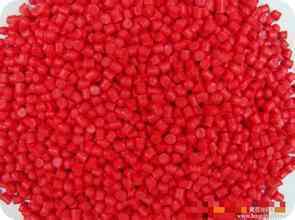 Low moisture absorption under high humidity or complete immersion is typical of many plastics. Thermal insulation usually goes together with electrical insulation in materials, and this is also true for polymers. 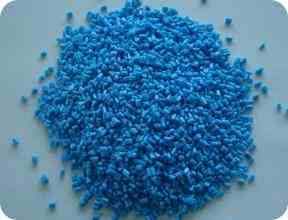 Thermal conductivity is further reduced by use of plastic or rubber foams. Air trapped in the expanded polymer reduces heat transfer and weight by orders of magnitude. In solid form, molded thermosetting plastics are used for pot handles to resist high temperatures as well as to allow the user to hold the hot pot. At the other extreme, plastics are used for ice cube trays because they are more pleasant to the touch than an icy metal surface, as well as being flexible at low temperature and easily cleaned. Chemical resistance to some degree is a feature of all polymers. Since polymers are made from a wide variety of monomers, each of which resists a different class of chemicals on a selective basis, it is possible to choose the correct one for each special chemical resistance application. For example, polypropylene resists strong acids and bases, but may be degraded over time by petroleum oil. On the other hand, nylons resist oils but are degraded by strong mineral acids. Substitution of suitable plastics for stainless steel and similar expensive materials is a common cost reduction measure in the chemical process industry. A few plastics, mosst notably fluorinated PE (Teflon®), have excellent resistance to almost all of the chemicals found in industry. Water resistance is also a feature of most polymers. While wood and most metals require periodic renewal of surface protection, plastics that have low moisture absorption have very long service lives in fresh- or saltwater. Water resistance is needed in piping and tubing, bathroom fixtures, boat hulls, raincoats, etc. Low density also is advantageous for marine uses where buoyancy is a functional requirement. Low energy requirements when molded as easily flowing melts at relatively low temperature (e.g., 150 °C-250 °C compared to 650 °C for aluminum casting). Economical tooling because of low forces required for melt processing, and generally noncorrosive melts. Generally, either a single-step shaping process or one in which most of the finished shape is accomplished in a single step. Some processes are continuous such as extrusion and roll-fed sheet then no forming and are thus inherently economical. Even non-continuous processes such as injection molding are economical because of short cycle times and multiple cavities. Injection molding on the order of 5-10 seconds per cycle is common. For thermoplastics, waste generated during fabrication is reusable with little penalty in performance or cost. Raw materials, polymers and compounding additives, are available at low costs because of a high degree of competition between suppliers and the fact that relatively low-cost petroleum is the basis for most of the materials. For example, ethylene feedstock and propylene feedstock cost about 25 cents and 15 cents per pound, respectively. (It is ironic that the major source for synthetic polymers is petroleum hydrocarbons. Petroleum derives from complex natural polymers such as cellulose that were broken down over the millenia by Mother Nature into simpler liquid and gaseous hydrocarbons. Now, the task of the polymer industry is to reconvert these hydrocarbons back into polymers that are superior in many ways to the original cellulose or other natural polymers). Some of the main limitations of presently known polymers will now be briefly discussed. Each will be covered in more detail in the course of the book. High temperatures are a limitation of all organic polymers. Useful long-term upper temperature varies from about 65 °C (150 °F) to about 370 °C (700 °F). Higher temperature polymers are being developed, but polymers with service temperatures above about 120 °C (250 °F) tend to be very costly. There is almost a linear correlation between service temperature limit and polymer cost. Reinforcement with fiberglass, other fibers, or certain particulate fillers is a cost-effective way to raise both service temperature and stiffness appreciably. Flammability is another limitation. Flame retardants such as chlorine and bromine compounds can be added to make polymers self-extinquishing and difficult to ignite. However, once ignited, halogenated burning material may produce toxic gases, presenting another hazard. On the other hand, certain plastics can be compounded to form a low thermal conductivity char when burned and the char actually protects the underlying structure. This principle is used in expendable nose cones to protect spacecraft during atmospheric reentry. Another complication is the current opposition of some environmentalists to any materials containing chlorine or bromine. Low temperature brittleness is another limitation that must be recognized by designers. Below the brittleness temperature, toughness of some plastics is reduced severely. In some applications, this condition dictates the selection of the plastic or rubber. Creep under sustained loading is a limitation of all plastics, and is inherent in their macromolecular nature. Essentially, creep is the slow but steady deformation of materials under sustained loads, even under very low loads compared to the strength of the material. It takes place in all materials and is very dependent on temperature, but the amount of creep deformation at ordinary temperatures of use is much higher for polymers, especially thermoplastics, than for metals or ceramics. Fortunately, many if not most, plastics products do not bear significant levels of sustained load and can be designed without concern for long-term stresses and strains. Resistance to wear and abrasion is generally lower for polymers than for metals, especially in comparison to hardened steels. This is a complex subject, however, and there are many cases in which polymers are the material of choice in abrasive situations. Rubber tires and conveyor belts are good examples. Also, many plastics have very low coefficients of friction and are used for bearings and anti-friction components. Teflons, polyacetals, and polyethylenes are examples of low friction plastics. Ultraviolet, gamma ray, and nuclear radiation resistance of most polymers is limited. For ordinary applications, dark-colored or black polymers resist ultraviolet attack in sunlight reasonably well. Certain plastics resist ultraviolet and weathering even in clear, transparent form, and can be used to coat and protect other materials. Nuclear radiation-resistant polymers are more limited, and adequate design data is difficult to obtain. Static electricity accumulation is sometimes undesirable. Most polymers are excellent electrical insulators, and can therefore hold static charges that arise from mechanical friction. An example is static electricity in carpeting. Antistatic treatments with chemicals on carpeting fibers helps alleviate this problem. Difficulty of repair compared to metals is often cited as a major disadvantage of plastics. A cracked metal can be welded and the weld may be stronger than the parent metal; the technology is old and familiar. Good practices and tools for plastics and rubber repair also exist; i.e., filler welding and adhesive bonding, but it requires much greater skill to make the repair appearance as good as the original. Ironically, polymer adhesives are used to join failed metal or wood parts, and even to patch small damages on glass windshields. An example of polymer substitution for metals in a high technology application is in the structures and fuselage of commercial and military aircraft Here, the driving forces are weight reduction (about 30% for composites such as carbon fiber/epoxy resin compared to aluminum), corrosion resistance, and superior fatigue resistance. Even though their strength/weight ratios are inferior to aluminum or titanium, fiber-reinforced polymeric composites can be superior overall due to their other advantages. For example, the current Boeing 767 is only 3% by weight polymer composites, but the new Boeing 777, intended for service in 1995，will use at least 8400 kg (18,500 lbs) of polymeric composites, about six times as much. The entire tail section will be of carbon fiber/epoxy composites. Some military aircraft, less sensitive to costs of construction than commercial aircraft, contain 30% or more of polymer composites in order to reduce weight and go faster and further. To prevent serious damage due to lightning, composite fuselage components are provided with copper mesh screens just beneath their outer paint coatings. An example of polymer substitution for metals in a lower-technology application is a small boat propeller using a single molding of fiberglass reinforced polyester. The blades are designed to break if they strike a rock, thereby protecting the shaft of the engine. Other advantages are weight reduction (1/3 the weight of steel), single piece assembly, and elimination of corrosion which causes propellers to freeze to their shafts. Presently, in order of market value, packaging is first, followed by building and construction, transportation equipment, electrical/electronic equipment, consumer products and toys, and furniture. Improved understanding of polymer characteristics, especially long-term and under combined stresses (that is, under combined mechanical, thermal, and chemical effects). Development and utilization of new materials and combinations of materials, especially in reinforced plastics or composites. Steady reduction in materials costs relative to competing materials, taking advantage of low energy requirements for processing, and economies of scale. Invention and commercialization of new processes. Continued improvement in quality, in part due to further automation and in-line measurement and control. Advancement in recycling technology to reduce environmental consequences of wider use of nondegradable materials.